I made this monster beanie yesterday, thinking it was going to be a gift for a 1 year old boy next weekend, but it is sooo hot right now, I really think my beanie will be an inappropriate gift! I will just have to make something else that is more summerish! Inspiration for this beanie came from googling images of ‘crochet gift for one year old boy’ then ‘crochet monster hat’, none were quite like mine. Using some more of the sea green I have left from the Wangaratte Mill, I started by making a beanie. I fitted it to my 1 year old son’s head, to make sure it would fit, using a 4mm hook. The first 6 rows are increasing, the very first round had 16 dc. The 2nd round increasing every 2nd stitch, so it’s 2 dc 1 dc repeated *, which makes 24 stitches in the round. The 3rd round increases 2 dc 1 dc 1 dc, repeated, the 4th round increases 2 dc 1 dc 1 dc 1 dc, repeated, the 5th round increases 2 dc 1 dc 1 dc 1 dc 1 dc. After that, each row just has the same dc as the previous row. To make a beanie for a larger head, you increase the number of increasing rows, to make a smaller beanie you decrease the number of increasing rows. I make rows until the beanie covered my son’s ears. You can make it slightly shorter, or longer if you want a turned up edge. I hope that makes sense to you, because it makes sense to me! 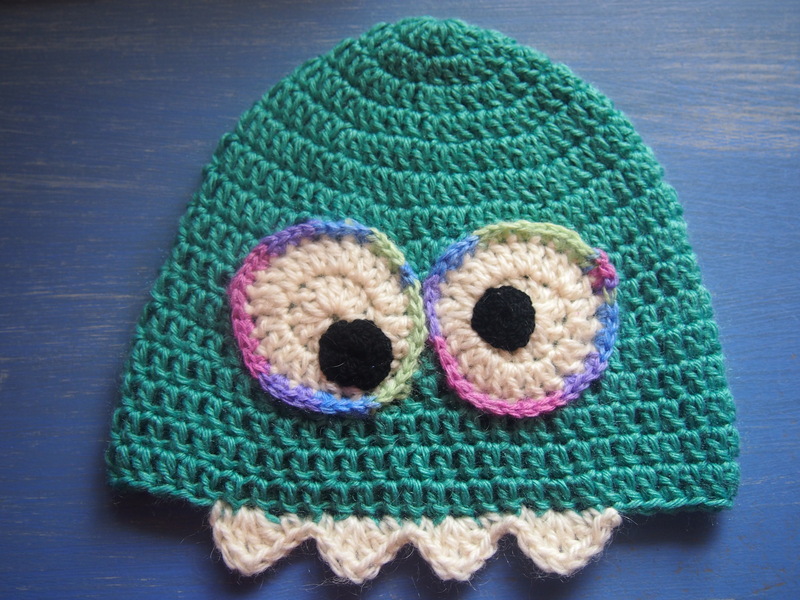 To make the beanie look like a monster I decorated it with two eyes and 4 sharp white teeth! The pattern for the teeth is 1 ch, 2 dc 1 ch 2 dc, 1 sc, 1 sl st, (1 sc, 2 dc 1 ch 2 dc, 1 sc, 1 sl st) x 3, for 4 teeth. Pull and pinch the ch at the tips slightly to make the teeth appear pointed. For the eyes, I made 2 flat circles in white. 1st round has 12 dc, the 2nd round has 24 as it increases 2 in every st. Then I made 2 smaller black circles, using finer black wool, I threaded the ends onto a needle to sew the eyes together and onto the beanie at the same time. To finish, I edged the eyes with varigated yarn, also from the Wangaratta Mill, to attach the eyes more securely. I think the multi-coloured edge to the eyes makes the monster more friendly looking, as does the wonky tilt to his eyes! I’m not sure what will happen to this beanie, I might give it away, or use it as a beanie for my son this coming winter. This was so easy to make, if my friends wanted some I’m sure I could whip up some more. I like making these as the colour choice is pretty open ended, which means I can use up some of this yarn that is piling up here! Here are two more sets for my Seasonal Drinks coasters collection, Winter and Spring. I borrowed inspiration from google images of winter colours and spring colours. I could have used other colours than I did of course, but I looked at what I had and went with that. These winter colours are not of a typical Australian winter, but include lots of white for snow. We do get snow in Australia, but only in certain parts and not where I have ever lived in my life! The winter set also has some green for the evergreen trees and royal blue, which represents the long hours of twilight. Spring is bright and cheery with mostly yellow, and some light blue and green. The blue represents the clear blue skies we got here early this spring, with green to stand for new growth. Yellow is for the new spring flowers and sunlight starting to warm things up. Choose darker coloured coasters when drinking red wine. Here is the first set of six coasters I am making to give as Christmas gifts. I hope the recipients don’t think they are too silly! I’m thinking each set will have 3 colours, a major, a minor and a highlight, which tells the story of a scene or season. This first one is called “Deep Sea”. The major colour is dark blue for the deepest part of the ocean, the minor colour of light blue is for the shallows, with a little white highlight for the tips of the waves. No two coasters are the same, neither are any two coasters a negative image of each other. The even number of coasters with random patterns reflecting both order and chaos in natural landscapes. After trying out a couple of different patterns, this one is my favourite coaster pattern from Crochetspot. I used a 4.5mm hook for this, and thick 5 ply COTON-A made by Sullivans, which is a 60% cotton blend with acrylic. Washing instructions are ‘Hand wash, do not bleach, dry flat in shade’. I would say to avoid putting red wine or coffee mugs on very light colours like the white. This round blue baby rug seemed to take ages! I’m so happy I’ve finally finished it, although it’s ended up a bit smaller than I thought it would be at 56cm across. I got the idea for this one from crochetspot, they were saying round is a good shape for baby rugs. I didn’t follow a pattern, I just looked at the photo for inspiration. I had already gotten a fair way into it when I realised I had 13 segements instead of 12. I couldn’t believe it (wait a minute – I know how to count)! I figured it would be ok and just kept going. Maybe 13 is a lucky number in this case, well that’s what I’ve decided anyway. This is the same pattern I used for the simple spiral white doily I finished last week, except for this rug I edged it with 5 trbl scallops. The reason it took so long is because, yet again, I used a 3mm hook and fine baby wool. Really, when I make a rug I should use a big hook and thick wool, then it won’t take so very long. I must have been working on this for a month or two, using nearly 3 x 50g balls of the blue 100% Australian merino wool I got on special from Lincraft. This year I’ve really gotten ‘hooked’ on completing projects. I don’t like how I start something and have incomplete projects around, although of course I do have some of those! I just felt a need to finish this one so I can get some Chrissie presents done – now I just have to figure what I could make as gifts that will be practical and nice, that they might like and not hate!